Obama Pitches One-Year Extension Of Tax Cuts For 'Middle Class' : The Two-Way The White House and Republicans have been at odds over what to do before the tax cuts expire at the end of this year. Today, the president is staking out his latest position. 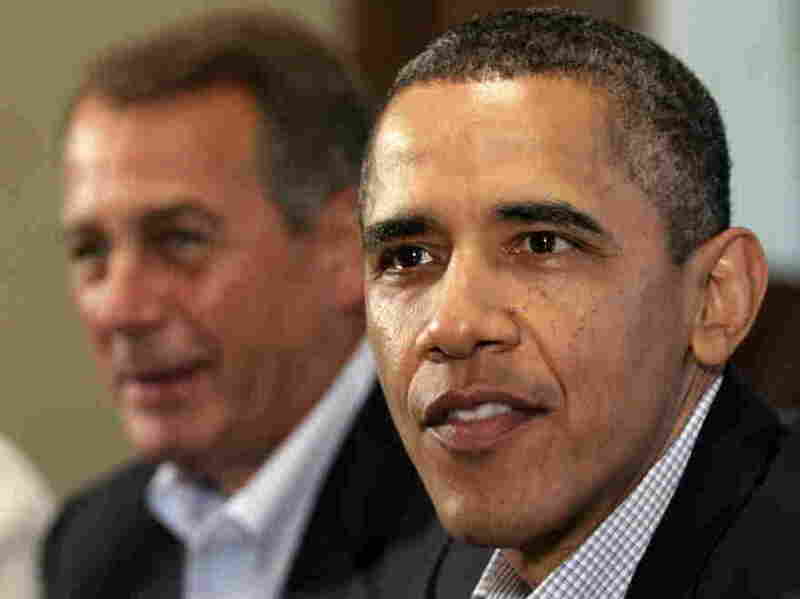 President Obama and House Speaker John Boehner, R-Ohio, at the White House in July 2011. Setting the stage for more election-year debate over taxes and economic policy, President Obama this morning challenged Republicans to support a plan to extend for one year — but only for families earning less than $250,000 annually — the so-called Bush tax cuts. Republicans want the tax cuts, which expire at the end of 2012, to continue for everyone. Obama says it's time for wealthier taxpayers to pay more because that will help narrow future budget deficits. To Republicans, Obama said: "Let's agree to what we agree on" — that middle class taxes shouldn't go up. Even as he was speaking, Republican leaders in Congress were expressing their opposition. It's long been President Obama's position that the so-called Bush tax cuts that expire at the end of this year should only be extended for families with incomes of less than $250,000 a year. And it's long been the position of House Speaker John Boehner and other leading Republicans that none of the Bush-era cuts should be allowed to expire — they should be extended for everyone, regardless of income. Obama makes the case that the wealthy can afford to pay more and that asking them to do that will help narrow federal budget deficits. Boehner and his fellow Republicans make the case that with the economy still seeming to stutter and job growth remaining weak, now's not the time to ask more of any taxpayers. Today around noon ET, the White House says, the president will deliver "a statement on the need for Congress to act to extend tax cuts for middle class families." According to The New York Times, what Obama will propose is "a one-year extension of the Bush-era tax cuts for people making less than $250,000." "The measure is the latest in a recent spate of moves by Obama that are a different form of political baseball than he played for much of his term. Instead of going for grand slams, he's been going for a series of singles - the immigration executive action, for instance, was one of them. It's a move related to the middle class, which also seeks to box in his rival." We'll update this post as the story develops, so hit your "refresh" button to see our latest additions. According to the president, "the proposal I make today would extend these tax cuts for 97 percent of small business owners." And to Republicans, he says: "let's agree to what we agree on" — that middle class taxes shouldn't go up. As he's been speaking, the staff of Republicans such as House Speaker John Boehner have been emailing reporters. Boehner calls the president's plan "raising taxes on small businesses." He is urging Congress, the president says, to "extend the tax cuts for the 98 percent of Americans who make less than $250,000 for another year." "I'm not proposing anything radical here," the president says, adding that he believes "anybody earning more than $250,000 a year" should see their tax rates go back to where they were during the Clinton administration — that is, before the Bush tax cuts. As he begins his remarks, Obama says that Republicans and Democrats have "two very different views about which direction we should go in as a country." He says Republicans believe "prosperity comes from the top down." He disagrees, Obama adds. The White House has turned on its live webcast, which means the president should be at the microphone soon. Update at 11:45 a.m. ET. Romney Campaign Says Obama Favors "A Massive Tax Increase." "President Obama's response to even more bad economic news is a massive tax increase. It just proves again that the president doesn't have a clue how to get America working again and help the middle class. The president's latest bad idea is to raise taxes on families, job creators, and small businesses. ... Unlike President Obama, Gov. Romney understands that the last thing we need to do in this economy is raise taxes on anyone. ..."